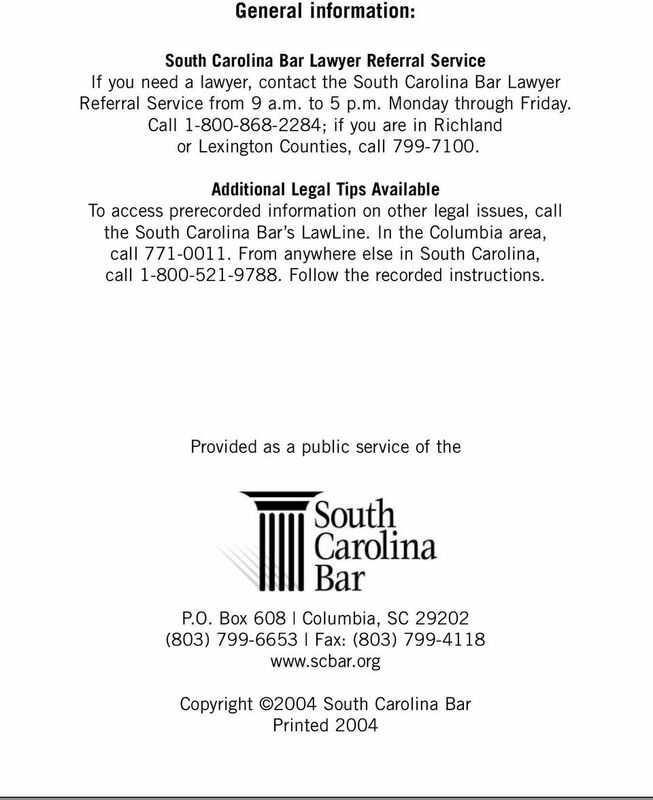 Download "SOUTH CAROLINA BAR. 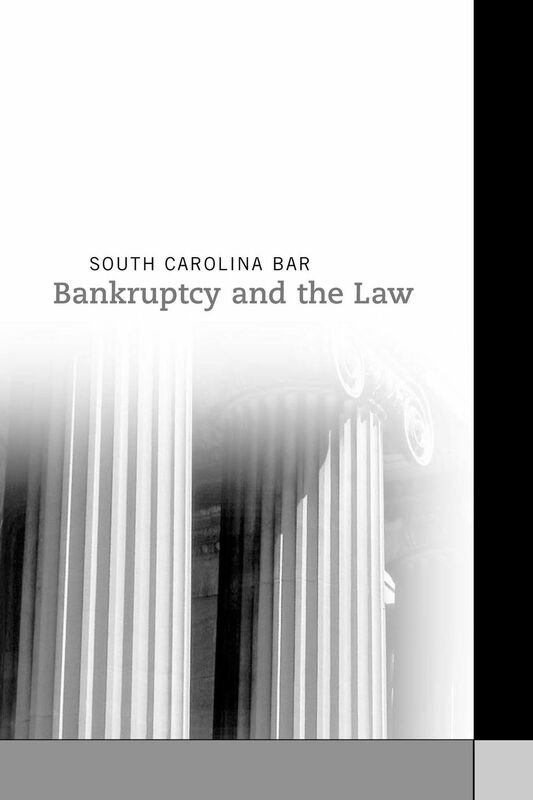 Bankruptcy and the Law"
3 bankruptcy, most debtors are granted a discharge of most of their debts. A discharge is a court order that prohibits creditors from taking any action to collect their debts. Creditors are barred from calling, writing or suing the debtor. However, there are some debts that are not affected by the bankruptcy and survive the bankruptcy discharge, including some tax debts, student loan debts, debts for alimony and child support and criminal restitution. Certain debts arising from fraud and other bad behavior may also survive the bankruptcy. Once the bankruptcy is over, the debtor may choose to pay some or all of his or her debt, but because of the bankruptcy, the creditor cannot force the debtor to pay. 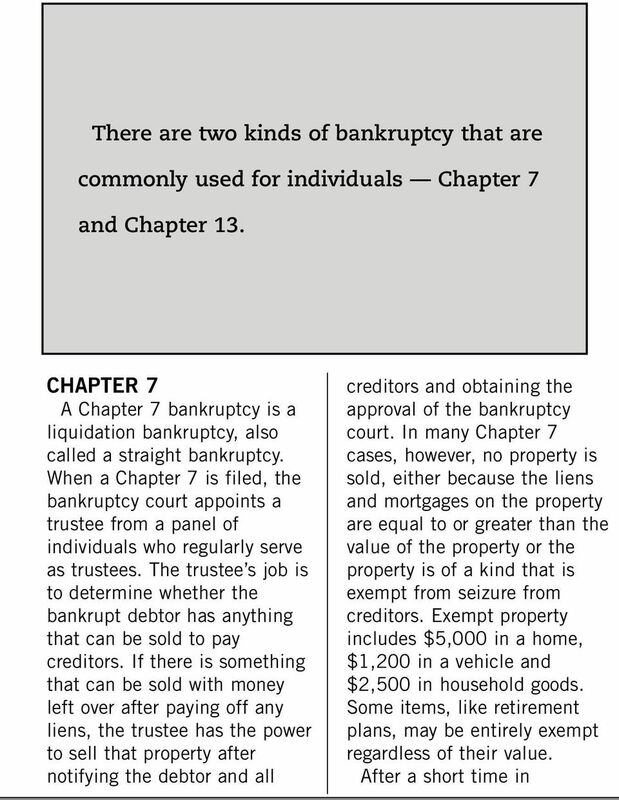 Chapter 7 does not discharge liens and mortgages except in very limited circumstances. Frequently, debtors are able to keep the items that have been pledged as collateral by arranging to continue to pay for them or to pay the value lump sum. 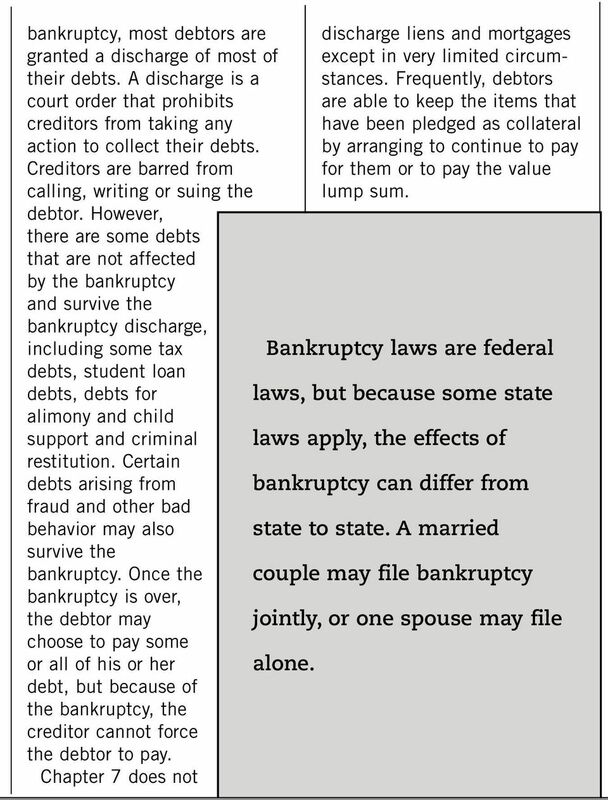 Bankruptcy laws are federal laws, but because some state laws apply, the effects of bankruptcy can differ from state to state. A married couple may file bankruptcy jointly, or one spouse may file alone. 5 the debts are discharged, except certain debts such as student loans. 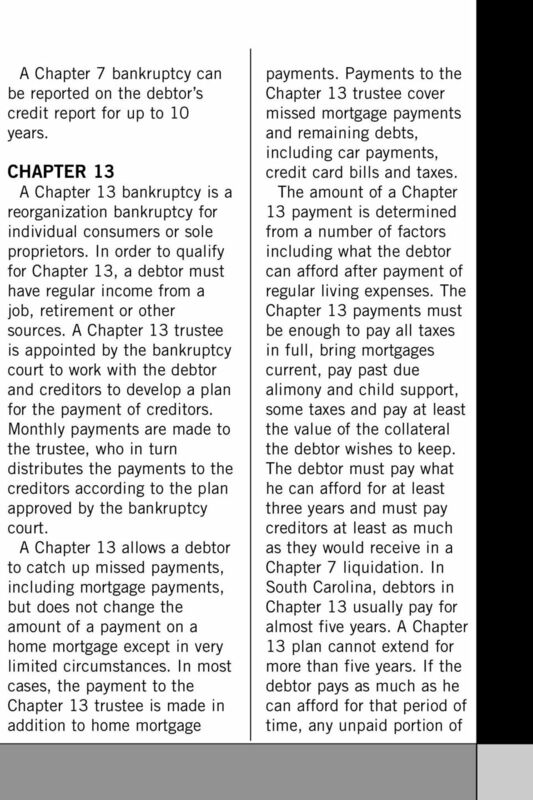 A Chapter 13 case is completely voluntary, and the debtor can dismiss the case at any time. 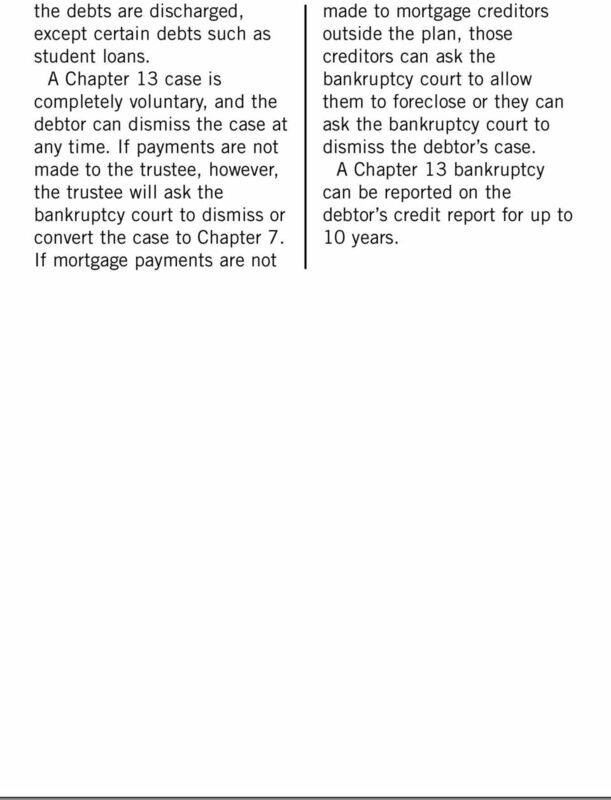 If payments are not made to the trustee, however, the trustee will ask the bankruptcy court to dismiss or convert the case to Chapter 7. If mortgage payments are not made to mortgage creditors outside the plan, those creditors can ask the bankruptcy court to allow them to foreclose or they can ask the bankruptcy court to dismiss the debtor s case. A Chapter 13 bankruptcy can be reported on the debtor s credit report for up to 10 years. Mailing PO Box 9440 Naples, FL 34101 Naples 5470 Bryson Court, Suite 103 Naples, FL 34109 Telephone 239-642-1485 Facsimile 239-642-1487 Email info@patrickneale.com Marco Island 950 North Collier Blvd. BANKRUPTCY; IS IT THE RIGHT OPTION FOR ME? CASE NO. I (We) hereby certify under penalty of perjury with regard to all secured consumer debts. 2011 Divorce and Bankruptcy Update by Eric L. Bolves, Esq. 2110 E. Robinson St. Orlando, FL 32803 (407) 894-1002 Bankruptcy Basics Chapter 7 -Liquidation of debts and assets. -Joint Debtors not protected.